Living within the chemo-physical gradient of light, nutrients and infochemicals, marine algae require cellular mechanisms to rapidly respond to these diverse signals. It only recently became apparent that phytoplankton utilize diverse cell signaling acclimation strategies to cope with environmental stress conditions. Still, very little is known about the molecular basis for their ability to sense and acclimate to environmental stress conditions, leading to their ecological success. Diatoms are ubiquitous marine photosynthetic microorganisms that are responsible for about 20% of photosynthesis on Earth and therefore are an important component of large oceanic biogeochemical cycles. During bloom succession, diatom cells are subjected to diverse environmental stress conditions that lead to production of reactive oxygen species (ROS) such as allelopathic interactions, nutrient limitation and exposure to infochemicals (DD, BrCN). Photosynthetic organisms produce ROS as a byproduct of oxygen-based metabolic pathways such as photosynthesis, photorespiration and oxidative phosphorylation. Perturbations in oxygenic metabolism under various environmental stress conditions can induce oxidative stress. 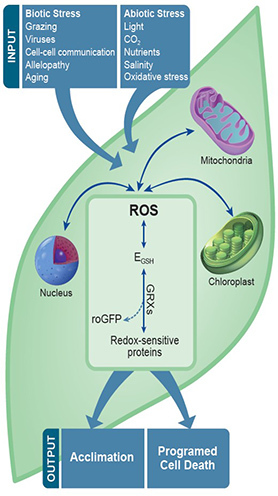 Although classically ROS were thought to be toxic metabolic byproducts that ultimately lead to cell death, it is now recognized that ROS act as central secondary messengers involved in acclimation to various stress conditions. The tight coupling between ROS generation, cellular homeostasis and metabolism serve as an important mode of controlling downstream signaling pathways and, consequently, cell fate mechanisms. How specificity of redox signaling is determined in response to diverse environmental cues? What is the composition of redox-based metabolic networks and how do they function during acclimation to stress? What is the role of organelle-specific redox patterns in regulating cell fate decisions? How does phenotypic heterogeneity between single cells determine cell fate within algal populations? Can we use diatoms encoding redox probes as sensors for detection of environmental stress in the marine environment? A proposed model for compartmentalized redox regulation in the cellular response of diatoms to environmental stress. Diverse environmental stress conditions which diatom cells are subjected to from the initiation of a bloom to its demise, can lead to increased ROS levels in specific cellular organelles. This leads to perturbations in the compartmentalized EGSH which is sensed by redox-sensitive proteins and the roGFP reporter. Signal transduction of this essential information may regulate cell fate decisions to either induce cell death or acclimate to environmental stress conditions.